designing and producing information that clients need internally or want to communicate to others. We have provided project management and communications support to several of British Columbia’s key multi-stakeholder processes (hotlink to project filter). We have designed and managed robust processes and structures for evaluating and advising on project selection and/or investment strategies (hotlink to project filter). And we have facilitated dialogue sessions, strategic and business planning workshops, and focus groups (hotlink to filter). Our clients include federal, provincial, and municipal governments; First Nations; businesses; associations; non-profit organizations; and communities. Our methods are outcome-driven, respectful, and inclusive. We offer a diverse range of services to meet client needs. 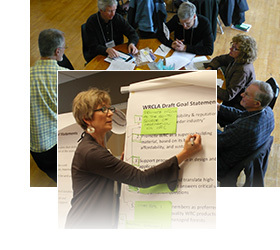 Some of these can be discrete – such as facilitation, risk analysis, or strategic planning. Others, like project management and external project communications, can apply to almost every project. We start by clarifying the context for the project, outlining assumptions and risks, identifying who is involved and key inputs/outputs, and confirming project scope. Next we discuss the types and levels of services that might apply. Finally, the client selects the services they need to achieve an effective solution in consideration of project goals and timeline, their expertise, and available resources (e.g., human, data, financial). The following are a few examples of how clients have bundled our services in a few key areas.